Fired twice! UV, weather, scratch, fade, frost proof. Heavy duty. Mosaic in stock! On sale! Mosaic below, in stock, price: $329.99, delivered to anywhere! 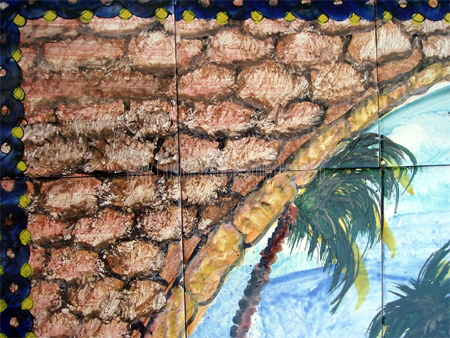 Product code: CCT 1235 - Individually hand painted tiles in Tunisia, Southern Mediterranean - World class hand painted and fired, glossy finish tiles. 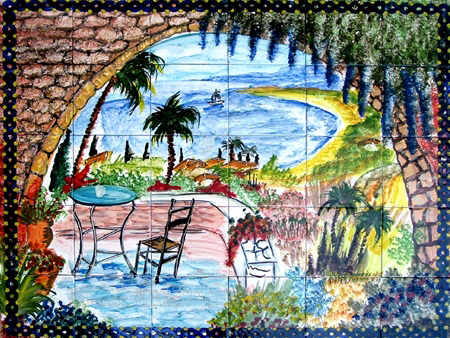 We would cut tiles to match your exact project dimensions, but it is suggested you stay within multiples of 6"x6" tiles (15cmx15cm) so your tiles look even when mounted. Enlarging: When the size of your project requires resizing an existing design, be advised, we may add matching content to the motif to insure uniformity. Shipping: Buyer to allow some 10 days for hand design and firing the project, and some 10-14 days for professional insured shipping to anywhere in the world.